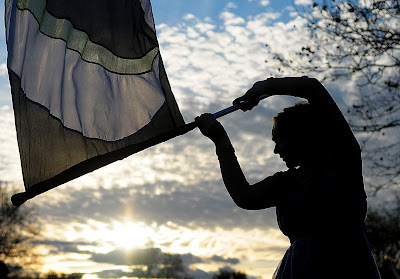 Sunday I photographed a marching band competition for the Morning Call. The competition went all day but there was only one local band that I needed to cover. Till the band arrived and started their warmup the sun was setting. As I watched the band warm up the color guard behind them caught by attention. I choose one of the color guard members who was away from some of the other girls and was warming up with one of her flags. As I photographed I moved where I was positioned to eliminate as many distractions as possible, including an instructor to the left of the girl and a light post to the right. Once I found the cleanest background and best angle to feature the setting sun I dropped my shutter speed to silhouette the girl. As she focused on her routine I fired away, not knowing what kind of turns and moves she would do next. Once she had completed her routine I flipped through and found this image, which I was pleased with. Unfortunately till it was the bands turn to compete the sun had set over the horizon and the stadium lights didn't make for any unique photographs as the natural light did.